Wild holidays in freezing hotels with dogs, ghosts, goblins and space invaders. Plus Zero-G weddings that are simply out of this world. Quite literally. TRAVEL journalism is not all romance and roses. It has a gritty side too. Several years back, much in the Bear Grylls Man-vs-Wild manner, I was handed a thermometer and sent off to research a story. Bear Grylls, as you know, is perhaps the only man on the planet who is unaware that you can catch a plane to cross Alaska. He jumps off waterfalls, digs into frozen caves, eats spiders, and gets chased by grizzly bears, in search of a decent travel agent. So I set off on my adventure, with my thermometer. Not to the Himalayas, but to Singapore, where I parked myself in the lobby of a swank five-star hotel. Life is tough, isn't it? We were researching a story called "Cold Welcome in a Hot Land". When the mercury plunged to 12 degrees Centigrade it struck me that this was more perilous than the final scene of The Titanic. At least that was shot in a bathtub, with fast access to the hot water faucet. Had I been a polar bear, I would have hugged the general manager in delight. Had I been Bear Grylls, I would have cooked the general manager on a homemade fire, but, being a lowly travel journalist, I concluded, wisely, that this was far too dangerous an assignment. I raced out to the sweaty, steamy 35-degree sunshine outside, nanoseconds before frostbite set in. Why Asian hotels believe air-conditioning must be maintained at sub-zero temperatures still eludes me. But, in general, the hotter the country, the colder the hotel. So, this winter, if it's polar temperatures you want, head to Singapore – where there actually is a White Christmas on Orchard Road, and I don't mean dandruff – or, check into the Ice Hotel in Swedish Lapland. The Ice Hotel is exactly what it's name suggests, a hotel carved out of solid blocks of ice. Visit the chic Absolut Ice Bar where even the glasses are carved from ice and chat up the local lovelies who may give you the cold shoulder. Take your parka along. In fact take several parkas. The average temperature here varies between minus 4 degrees Centigrade and minus 9 degrees Centigrade. This temperature variance depends not upon the air-conditioning – there is none – but upon the temperature outside and the number of guests within. The more people, the warmer it is, relatively speaking. It is perhaps in your interest to visit at peak season. MAKE FRIENDS AND KEEP THEM THERE. Remember, if anyone checks out, the mercury drops, and we don't want that. This giant, modern igloo can only be visited in winter when the toiling residents of Jukkasjarvi haul 10,000 tons of clear ice from the Torne River and 30,000 tons of fresh snow, which is then blasted over a skeleton structure to create a hotel that holds up to 100 people. Snuggle in sleeping bags laid out on reindeer pelts. If you get lucky you may end up in the Ice Chapel to enjoy a relationship frozen in time. The wallet will get modestly exercised but the aurora borealis Northern Lights show is free. Jukkasjarvi, the name of the local town, means "meeting place" so it comes as no surprise that there are conference facilities for up to 120 people. Didn't get a raise? Send your boss to Sweden to chill out and think it over. It doesn't get any cooler than this. 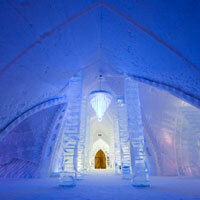 Or explore Canada's Hotel de Glace, 10 minutes from Quebec City. The hotel runs from 6 January to 25 March. 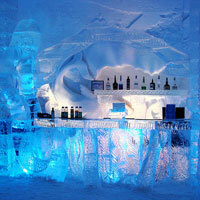 Set in a nature park, it offers the customary Ice Cafe and an Ice Chapel. Best of all, if you get cold feet at the altar, you can always retreat to a warm city hotel. Those who prefer not to flirt with frostbite can visit Hotel de Glace for a day's outing. You can also do a package with sauna and hot tub escapes under the stars, and even a spot of dog-sledding. Do brush up on your French. So now that you've got snow in your hair and wind in your face, why stop here? For a true dog-sled adventure (self-drive of course, no license required) Canada's frozen north has it all. For a romp with the huskies, try someone like JAC Travel. They will even rustle up a polar bear migration in Manitoba. With global warming polar bears are all heading to cooler climes, in Singapore. I'm not sure how polar bears migrate, or whether they catch planes or trains, but they are true carnivores and would enjoy nothing more than tender tourist steak. rare. So the thrill works both ways. 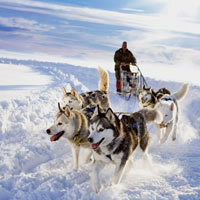 Or try sea kayaking with orca whales...and half-day dog-sledding packages from Quebec City. Of course, you can hop back to Sweden or Norway for a spot of wild outdoors in Lapland, with Nordic Visitor which runs four-day tours packed with dog-sledding and mushing through pristine snowy wilderness that is so remote even Bear Grylls and David Attenborough haven't discovered it yet. Nothing quite like a wild romp with man's best friend. Huskies and polar bears have similar dietary cravings by the way. Your iPhone may even work so can post lots of pictures on Facebook revealing the truth behind dog-sledding, with the huskies cracking the whip and you pulling the sled. Time was when hotel design meant planned space, form and function, proportion, and aesthetics, within the bounds of the Laws of Physics. That’s Dullsville. Now, everyone with the right iPhone app is a designer. As the world moves online, power has gravitated from BMWs and boardrooms to prams and prepubescents. Forget Planet of the Apes and think Planet of the Babes. It’s called devolution. How often have you been humbled by the simple bedside light? I can never find the right switch and live in fear the butler may turn up. This is a profoundly Christian experience, revelatory, humbling, and far less messy than being thrown to the lions. Think hairdryers thoughtfully bolted to the floor with three-foot cords so you can kneel while blow-drying your hair. Step into one of those toilets with the fancy shower toggle and you suddenly understand the frightening complexity of an A380 cockpit. Still, sometimes, it can be fun. Here are some amazing hotels. For a canine carnival with a difference, there's the remarkable Dog Bark Park Inn in a corner of Idaho, USA, where pups and peers stay in dog-themed rooms. 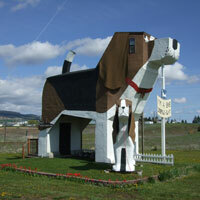 This whimsical retreat for dog lovers looks like a giant beagle. There's even a giant fire hydrant – in case the guests need to use the facilities at night. This is a pretty bustling place. As the brochure says, “Cottonwood, 924 population and the second largest community on the prairie...” Not quite Hong Kong, and that's the appeal. So who let the dogs out? Will we ever know? 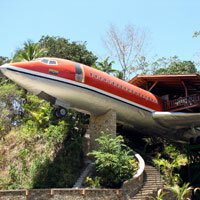 At Costa Verde Costa Rica, stay in a red vintage 1965 Boeing 727 that was painstakingly reconditioned. Plunging out of the foliage, the plane is a much-photographed oddity. This is the spot to pick if you suffer from fear of flying. The interiors are sumptuous, and inviting, with gleaming timber underfoot, and spacious bedrooms. And that's a genuine, fully-flat, 180-degree recline seat. For the less intrepid, there are regular cottages too and a normal, ground-level swimming pool. The Tianzi Garden Hotel, also called the Son of Heaven Hotel, in Langfang, Hebei, is built in honour of the ubiquitous Chinese Gods representing fortune, prosperity and longevity. But this is no ordinary cinderblock. 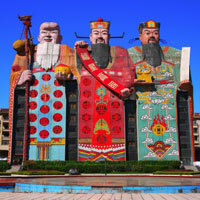 The hotel is actually built in human form with giant statues complete with beards, coloured robes and full regalia. Is that you looking out of the belly button? For those yearning to get back to nature, the Hang Nga Guesthouse (also referred to as the Crazy House) in Dalat, Vietnam, resembles a gnarled tree going through a midlife crisis with a surprised giraffe looking on. The hotel was created by Dang Viet Nga, drawing inspiration from nature, animals, birds, and insects as well as Antonio Gaudi (responsible for the Sagrada Familia in Barcelona). Encounter caves, tunnels, spider webs and giant mushrooms as you attempt to find that light switch. The entire exterior is covered in vines, branches, roots, and mysterious forms. Munch on magic mushrooms and enjoy the trip. We love ghosts in Asia. But they're hard to come by despite whatever the paranormal TV channels will tell you. In USA, San Diego’s Hotel del Coronado, or The Del as the place is affectionately known, creaks with tales of ghostly apparitions, mostly relating to Kate Morgan who, on Thanksgiving Day, 1892, at the age of 24 and very pregnant, arrived at the hotel to confront her no-good gambler husband. She checked into room 3502 under an assumed name, so the story goes, discovered her husband with another woman, and was found conveniently dead, the next day, a bullet through her head. The coroner’s verdict? Suicide. She is said to still wander the corridors dressed in a coat and gown, guests claim to have spoken with her, and maids report the sound of weeping from room 3502, even when unoccupied. The venerable Raffles in Singapore is said to have the occasional poltergeist on the prowl. Many stories but few sightings. Bali offers richer material for a holiday haunting. In January 1993, the Grand Bali Beach hotel in Sanur, a nondescript high-rise block, was gutted by a fire, and just one room mysteriously escaped unscathed. Room 327. This was a room dedicated to the legendary sea queen, Nyai Loro Kidul. Clearly she was displeased – perhaps on account of the exceedingly dull architecture – and she smote the hotel while protecting her own residence. The story made headlines. Priests were rushed in to perform additional rites, incense swirled, and when the hotel was rebuilt, far grander than before, but still nondescript, room 327 was lavishly adorned in green, the goddess's favourite colour. I had the opportunity to visit the hotel shortly after it was rebuilt and I was directed to an extensive photo exhibition in the lobby. “Which building is this burning down?” I enquired. “This hotel sir,” responded an earnest doorman. A brave choice for a hotel exhibition, I'd say. It's a wonder any guests remained. But, that's reverse psychology for you. If you are pondering the question that so torments visitors to Sri Lanka – “Who is Helga de Silva Blow Perera?” – find out. At Helga’s Folly in Kandy, whimsy is pushed to the extreme. Pink runs into orange, classical paintings rub shoulders with pop art, and there is a riot of colour and experiment. It is eccentric to the extreme. Need a fantasy wedding? You've come to the right place. The love-knot ceremony includes elephant rides with drummers and the dance of the virgin girls. I'm not sure if the elephants are virgins, but you could ask. The good news is, Mahatma Gandhi once stayed here, so you should be just fine. Helga is the eccentric lady who runs the family home that has been around since 1930. Grab a tall tropical cocktail and have a trawl of the grounds and building. Head Down Under, to Coober Pedy, South Australia, where you can truly dig deep in to the local history. Next to the opal mines high above town is The Underground Motel excavated out of a sandstone hill. It opened in 1984 and has been through various refinements though the feel remains cheap and cheerful and resolutely rustic. The advantage of burrowing into a hill, instead of actually descending vertically underground, is that all rooms have access to natural light and ventilation. They also have private bathrooms and showers. But then deserts may be too dry, and hot, for some. If you need water, and lots of it, fly off to the Conrad Maldives on Rangali Island, a sliver of sugar-white sand in turquoise seas. For an underwater experience, that still keeps you dry – non-swimmers take note – step down 16 feet below sea level to the Ithaa Restaurant and dine in a unique glass bubble aquarium surrounded by amazing marine life. While you pick your fish, the sharks will be watching you with keen interest, from the other side, as they choose their menu. "Hmm, I like the fat guy in the yellow tie." "How about that talkative Indian bloke?" "Naah, too skinny." 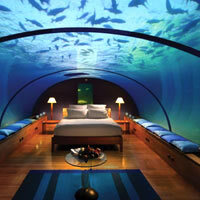 For special occasions and with at least two weeks' notice – giving you enough time to rob a bank to pay for this – Ithaa can be converted into a wedding suite offering yet more scandalous entertainment for your marine neighbours, and lending new meaning to the term, sleeping with the fish. Or you might try something completely out of this world. And I do mean, out of this world. 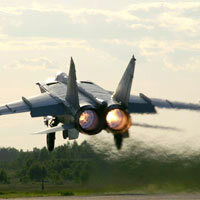 If it's just a regular high you need, do a Mach 2 flight grazing the edge of space at 80,000ft, in a screaming MIG-25 Foxbat. Priced around US$12,000, it includes breakfast, just in case you thought the operators were cheapskates. I'm glad they threw that in, even if you, are going to throw it up. You also get a couple of nights at a Moscow hotel. All this and more from Incredible Adventures and the good folk at the Yuri Gagarin Cosmonaut Training School, at Star City, Russia. Modestly cheaper are the lower altitude Illyushin 76 flights to simulate weightlessness, in sudden bursts. Great for the ego, terrible for watching the in-flight movie. USA-based Space Adventures – which has sent seven clients into space including the American businessman Dennis Tito in 2001 for a sum of US$20 million – can also organise zero-gravity flights where, for a brief moment, and not without trauma to your wallet, you can experience weightlessness. 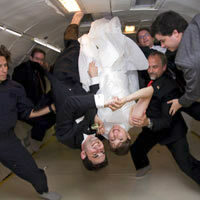 Get married in zero gravity and see your world turn upside down. Why wait? You wake up each morning wondering how to shed those pounds? This is how. On a Zero-G flight on a reconstituted Boeing 727 that does stuff airline pilots only dream about – and I don't mean the inflatable dolls and stewardesses and boring YouTube videos. We're talking parabolic arcs, loops and spins that make even Aeroflot look like a toddler. All it costs is US$5,000, not counting the five percent excise tax. Reserve your seat on a sub-orbital flight or even a space flight. It's all around the corner. Floating M&Ms? Amazing. Take your pick.